How digital citizenship and responsibility is or isn't part of our art education. What do we do in regards to #4 of the NETS, what does it mean to those attending the meeting, to those outside the USA, and as a USA national standard in education. SageStage Minotaur: I think the collaborative type projects with people with different access to broadband relates to this NET. In my class, this semester we are focused on themes of creativity, collaboration, remix, and multiple perspectives. Marvel Recreant: since I am the most digitally literate person, I think that allowing for digital options as responses to class work is my best shot. Liliann Ling: what does digitial citizenship mean to people who don't have access to the Internet? SageStage Minotaur: Accessibility for those in Uganda that we are collaborating with is difficult. They can not access SL for example with a 48K Broadband and electricity that goes off. We are also collaborating with Finland in which broadband is considered a basic human right. Marvel Recreant: there is a choice to use newer media. how do you include people who are not interested in going digital? or do you leave them out? SageStage Minotaur: Collaboration sometimes seems at odds with creativity to the pre-service teachers in my class I mentioned. How they want collaborations to function is at odds with their goals of creativity. I do set up situations, like taking 1 part of 16 machinimas for 1 min. machinimas created individually. There are 1000s of ways that collaboration can occur. These are the questions I posed: 1. Creativity: Based on your definition of creativity, identify and discuss one process that stimulated creativity thinking, practice, and/or product. 2. Collaboration: How did you sustain difference in working with others? Describe one strategy that you will do and recommend to others to do in working with others who are at a distance and different from you. 3. Multiple Perspectives: Discuss what is learned in looking at a cultural narrative (the script/inscription) in different ways. SageStage Minotaur: The students seem very motivate to communicate with others in a focused way in different parts of the world. One student wrote: This project was a great success and because it's our first time ever callaborating I think we learned so much about the process. I think both UA and PSU will take away alot from working with eachother. Personally, I know I had issues with the callaboration but I know I can work to better my expeience. In my future classroom, I reccomend that the group members have a very open mind, and be willing to change the ideas. I would also set my students up with a schedule for meeting and working together. In this one, it was very up in the air and a lot didn't get completed together, if time could be set aside to work, it would be much more successfull. It takes a sense of play with the technology, and play takes time. 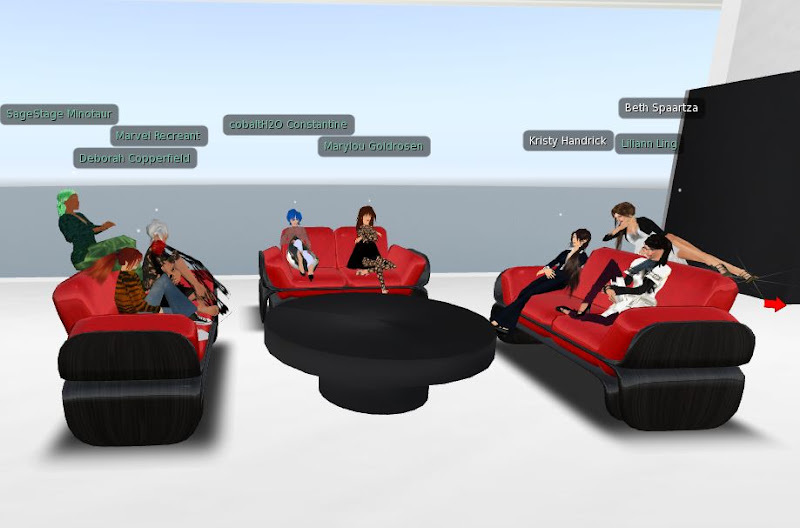 In a SL project in which students created an object attached to his or her avatar, one wrote: The strategy that I found most stimulating for creativity was the idea of creating an object with a double meaning. A personal meaning and then a meaning for the audience. For example in one of the machinimas a character had a flashlight. The flashlight in the movie was a guiding light to help the avatars find their way around then when asked what the flashlight meant to the person who created it, that person explained it was a way to shine a light on art for her students. I think it would be really interesting for students to make work with these two different scopes, personal connection and functionality. Marvel Recreant: the peace project based on guernica is a good example of that -- the murals travel around the world adding one after another. Marvel Recreant: this may be a key -- there is an opportunity for art ed folks to communicate with diverse populations of art teachers and students in InSEA. what do we do with non-tech folks who are afraid? I actually think that a step by step generation of ideas would help us all. SageStage Minotaur: Peer teaching is a good idea for many reasons, and in contexts beyond digital and technology. We talk about fears with technology at the beginning of a semester and that we need to learn from and help each other, and that they will teach me. I also model problem-solving with technology--things that I do as many of their ideas are beyond my tech knowledge--so we figure it out, or they figure it out with others and show me. Borg Sugarplum: I have a question about the future of technology, Wolfram thinks we are heading towards cellular automaton, what do you think? and also about Kurzweils exponential growth scenario's what do you think? SageStage Minotaur: Ernest heard on NPR that some kind of headband can stimulate a part of the brain to be good in math. The thinking cap may be physically worn in school in the future. thinking cap used to be a metaphor. Borg Sugarplum: you will love cellular automaton for simplexity. 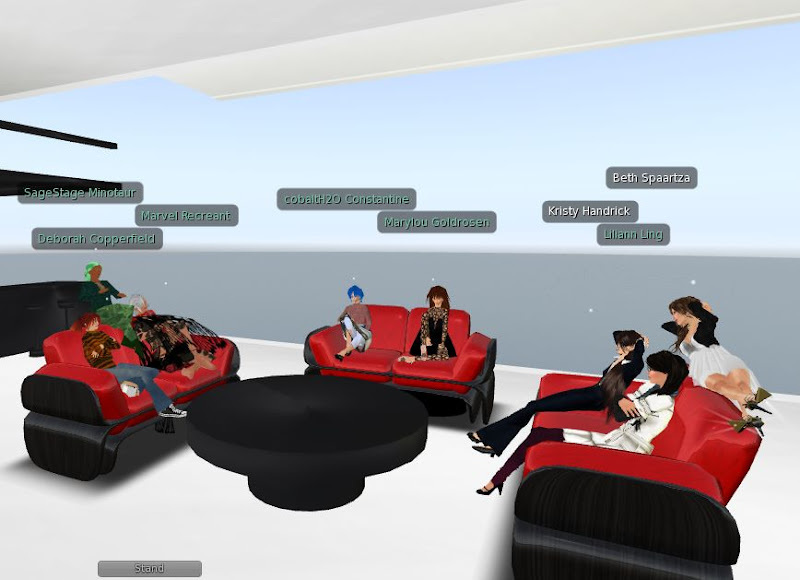 FIELD TRIP: Field trip: Simplexity http://maps.secondlife.com/secondlife/NMC Campus West/124/128/1492 The field trip discussion: Can we/ How can we inspire student learning and creativity with digital art? Next meeting discussion topic: How do we make feminism(s) visible in our teaching? What strategies do we apply? How can we make feminism(s) more visible in our teaching? We will have Linda Hoeptner Poling as our Facilitator.